To add content directly from your web browser to your content library, you can use one of our browser extensions. 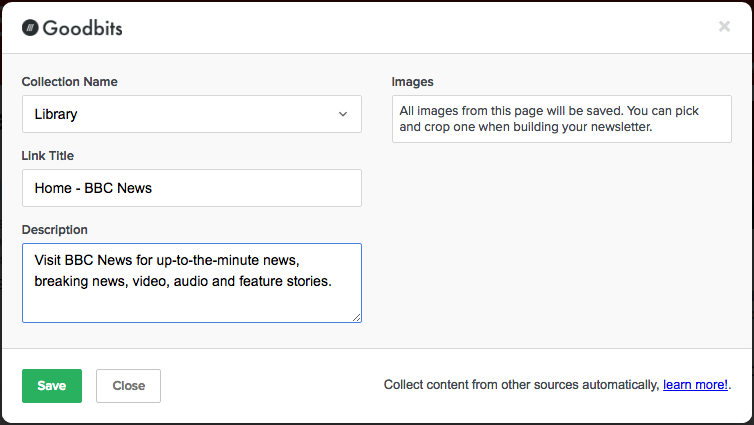 This will allow you to easily save an article to your content library. Outlined below are the web browsers we support and some information on how to install Goodbits with them. All of our extensions will show you our Goodbits add link popup which allows you to pick and crop a thumbnail, as well as edit the title and description. To install our chrome extension, simply visit our extension on the chrome extensions store and click install. After installing, you'll see our Goodbits button appear next to the web address. Just click on it. To install the browser extension for Safari or Firefox, visit the settings for your email and head to the tab called 'Tools' and select the browser shown. With Safari, you will have to locate the downloaded file. Normally on Macs this will be your 'Downloads' folder, visible in your Finder. Load the file 'goodbits.safariextz' to complete the last step to install into Safari.